The increase in the number of children being diagnosed as having some form of autism has meant more awareness. With it has come more information. When Jodi was diagnosed all the information I could get was written by so called “professionals” who studied, but didn’t actually live with autism 24/7. It made depressing reading. I was informed that by the time Jodi was fifteen he’d most likely be in a home because I wouldn’t be able to cope. How wrong they were to write him off and take away my hope before his journey had even begun. Now there are books written by parents, siblings and even by autistic people themselves. Websites and support groups are springing up all over the place and the message out there is you are not alone. When Jodi was the “child from Hell” I felt so isolated. No-one came to see me and I couldn’t take him out. I suppose everyone felt as helpless as I did and it was easier just to stay away. How I longed to be treated normally. After all I hadn’t changed. I just had a child with autism. Now, however it needn’t be like that. Autism creates many problems within the family environment. Relationships are strained and siblings suffer. Mothers of autistic children often have to deal with a lot of undeserved criticism from people who don’t understand. Don't suffer in silence though. Join the support groups. Go on line. Talk to others in your situation and most importantly don’t feel guilty. If you take your child out and he or she behaves in a manner which might appear inappropriate for a “normal” child don’t worry about what others think. If they have a problem it’s their problem – not yours. Autism has nothing to do with bad parenting. Give yourself a break! Started in 1998 by a mother of a child with autism, Karen Simmons has set up a wonderful resource site. She has recently issued a book entitled,,"The Official Autism 101 Manual" which has already rocketed to #13 on Amazon.com's bestseller list. Demand continues to be exceptional and the book is now entering into its second printing. child with autism or their patient. 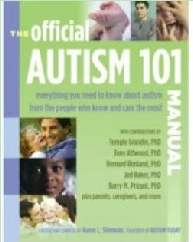 confidently find your way through the autism maze. Guidance for oral health for parents of children who suffer from autism. Watch the video!